Sin City Scene: Life is Beautiful Las Vegas! 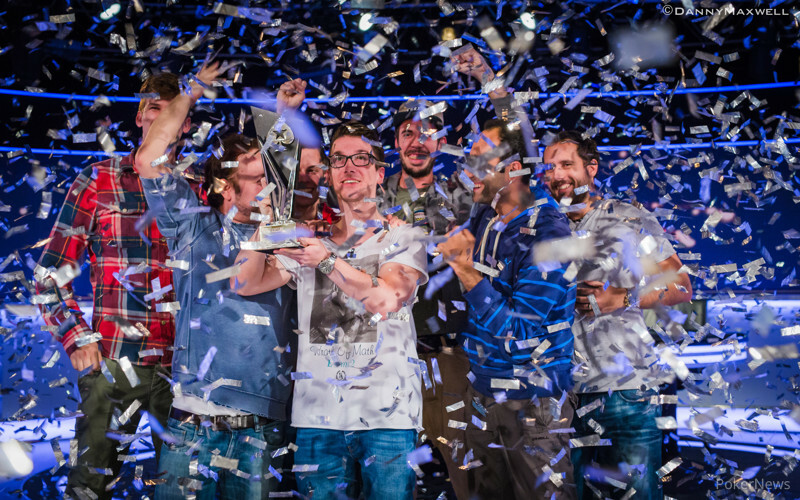 After a week-long battle at the Grand Connaught Rooms in central London Sebastian Pauli was crowned winner of the 11th EPT ever hosted in London. Pauli took home £499,700 after an epic finale table that turned out to be one of the most entertaining and high-level final tables in recent memory. Kevin MacPhee was the unfortunate runner-up, but the £308,500 prize he took home will surely be a nice consolation. The final table started with eight men hungry for an EPT title, two of which had already experienced that feeling before. 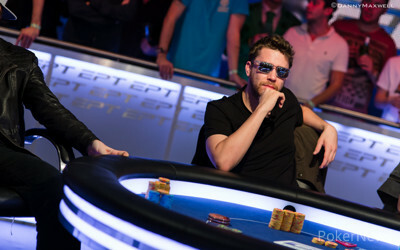 Team PokerStars Pro Jake Cody took down EPT Season 6 Deauville while MacPhee won the Season 6 Berlin title. These two champions turned out to be the headliners everyone expected them to be. The first level of play at the final table was one of the most thrilling in the history of televised poker, but interestingly enough of the eight finalists were eliminated from play. Many big hands were made, but some of the folds were even bigger. Cody made the biggest fold of the day when he gave up with top pair top kicker on the river against Kevin Killeen's kings. Even though chips shifted around quite frequently the chip lead was never within reach for anyone besides Pauli, who carried a big advantage throughout the final table. Jonathan Bensadoun and Pablo Gordillo were among the first players to get in danger of being knocked out, but it took several hours before we lost our first player. Gordillo eventually hit the rail in eighth place for £51,900 when his ace-ten was no match for Killeen's pair of treys. 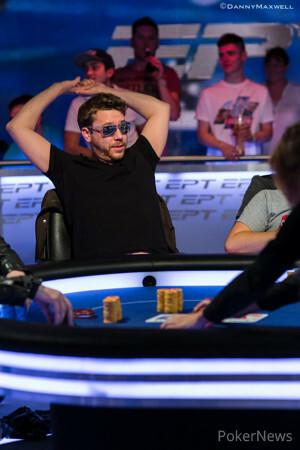 Moments after Gordillo's elimination it was Bensadoun who busted in seventh place for £75,900 when he ran with ace-queen into Artur Koren's pocket kings. At this point 67 hands had been played and Pauli had gradually been extending his lead. On the 78th hand of play Cody to doubled through Koren to 4.8 million with fours against ace-king, but the former Deauville champ would never get closer in chips to winning his second title than after this hand. A few hands later Koren doubled through MacPhee and the lone American became one of the short stacks after this hand. On Hand #98 it was MacPhee's turn to double up as Cody took a shot at knocking the player to his left out with king-queen suited against ace-three suited. MacPhee's hand held up, levelling the playing field even more behind Pauli's mountainous chip lead. In the 30th level of play we lost Jakub Mroczek in sixth place for £104,200 when he ended up all in with ace-eight suited against Killeen's tens. Mroczek had battled with a short stack for the entire final table and finishing sixth was nothing short of impressive. Eighteen hands after Mroczek was knocked out MacPhee and Cody were all in against each other again. This time it was Cody who tanked for several minutes before calling MacPhee's three-bet shove with queen-jack suited. MacPhee showed ace-eight suited, and while the river gave Cody a pair of jacks it also filled up MacPhee's flush. Cody was now the short stack, and after chopping an all in for his tournament life, he was knocked out moments later by MacPhee. Cody took home £133,800 after putting on an amazing show this week, but it wasn't his time yet to take down another EPT title. In fourth place we lost a German living in Austria, as Koren busted to Killeen in a battle of the blinds. Koren limped with eights in the small blind and snap-called when Killeen put him all in with queen-jack. The board gave Killeen two pair and Koren walked away £168,900 richer, but his dream of winning this EPT abruptly ended. The final three players briefly discussed a deal, but Pauli's unwillingness to accept ICM, as he found it unfair for the chip leader, made play continue with all the remaining money still on the line. Killeen became the eventual third-place finisher for £220,500 when he shoved ace-seven of diamonds into MacPhee's ace-queen. 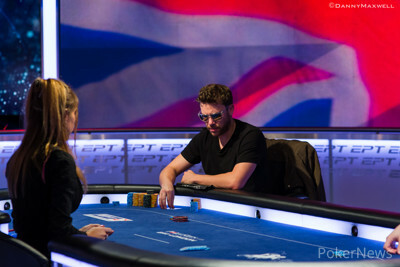 After a short break MacPhee started the heads-up battle for his second EPT title with 7,445,000 chips versus Pauli's 12,810,000-chip stack. At no point did Pauli give up his chip lead, but MacPhee came very close to closing the gap completely. Just when the momentum seemed to be shifting towards MacPhee, Pauli woke up with pocket aces and took a big lead again. On the final hand MacPhee raised to 320,000, Pauli three-bet to 860,000 and MacPhee moved all in after quite some tanking. Pauli snap-called with ace-queen and beat MacPhee's ace-ten. MacPhee almost became the second two-time EPT champion, but in the end Germany gets its second champion of the 11th season of the EPT. Hand #207: Kevin MacPhee raised to 320,000 from the button with and Sebastian Pauli three-bet to 860,000 with . MacPhee went into the tank for quite a long time before moving all in and Pauli snap-called. The flop brought out and MacPhee picked up some outs for a chopped pot. On the turn the hit and MacPhee added a flush draw to his outs, but the river was the and it was all over. 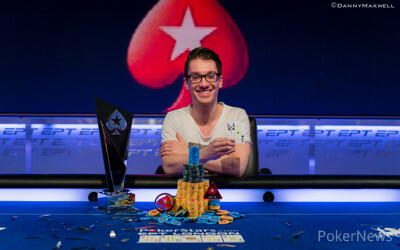 MacPhee finished in second place and Pauli is our new EPT champion! Hand #205: Kevin MacPhee had the button. He looked at and raised to 320,000. Sebastian Pauli called with and the two saw hit the felt. Pauli checked, MacPhee bet 275,000, and Pauli stayed the course. The turn was the and both players checked, allowing the to complete the board. Pauli checked the river and MacPhee fired 1.15 million with his newly made full house. Pauli let his hand go and MacPhee pulled in the pot. Hand #206 Pauli looked down at on the button and he raised it up to 325,000. MacPhee called from the big blind with and the flop fell . Both players checked flop and did the same on the turn. The hit the river and it went check-check one final time. Pauli's fives were the best and he took down the pot. Hand #201: Kevin MacPhee folded his button, allowing Sebastian Pauli to win the pot. Hand #202: Pauli folded from the button. Hand #203: MacPhee folded from the button. Hand #204: Pauli looked down at and raised the action to 325,000. MacPhee found in the big blind and flatted to see a flop. The dealer fanned and MachPhee check-called a continuation bet of 325,000. The board paired on fourth street with the . MacPhee checked for a second time and Pauli knocked the table in reply. The on the river put trips on the board. MacPhee took this opportunity to fire out 780,000. Pauli came over the top for 1.95 million total, sending MacPhee into the tank. Ultimately, he plopped out a call and saw Pauli's eights full of aces. Hand #195: Sebastian Pauli raised from the button to 325,000 with and Kevin MacPhee folded . Hand #196: Sebastian Pauli received a walk. Hand #197: Sebastian Pauli raised to 325,000 from the button with and Kevin MacPhee called with from the big blind. The flop came down and MacPhee check-called 350,000. The turn was the and MacPhee checked again to Pauli who bet 800,000 and MacPhee folded. Hand #198: Kevin MacPhee raised from the button to 320,000 with and Sebastian Pauli called with . The flop brought out and Pauli lead for 400,000 and MacPhee called. The turn was the and Pauli lead for another 750,000 and MacPhee raised to 1,680,000 and Pauli folded. Hand #199: Kevin MacPhee raised to 320,000 with and he picked up the pot. Hand #200: Sebastian Pauli raised to 325,000 with and Kevin MacPhee called with . The flop brought out and MacPhee checked to Pauli who bet 325,000. MacPhee called and on the turn the hit, on which he checked again. The river was the when Pauli checked as well and MacPhee lead out for 715,000 and Pauli folded. Hand #191: Sebastian Pauli had on the button. He raised the action to 325,000 and Kevin MacPhee moved all in over the top with . Pauli quickly folded. Hand #192: MacPhee folded his button. Hand #193: Pauli held and raised to 325,000. MacPhee peered down at and moved all in over the top for 3.07 million. Pauli folded and MacPhee won the pot. Hand #194: MacPhee was on the button. He made it 320,000 to go and Pauli moved all in over the top from the big blind. MacPhee called for his tournament life of 3.415 million and the hands were turned over. The baord ran out , giving MacPhee an ace-high flush for the double. Hand #188: Kevin MacPhee raised from the button to 300,000 with and Sebastian Paili called with . The flop brought out and both players checked. On the turn the hit and Pauli bet 300,000, MacPhee called. On the river the hit and both players checked. MacPhee won the pot and chipped up a little. Hand #189: MacPhee received a walk. Hand #190: MacPhee raised to 300,000 from the button with and Pauli three-bet with to 545,000. The flop brought out after MacPhee had called and Pauli bet 800,000. MacPhee grabbed chips and made the call. On the turn the hit with 3.3 million in the pot and Pauli checked to MacPhee after having made two pair. MacPhee checked behind and the river was the . This time Pauli bet 2.2 million while MacPhee only had 5 million left behind. MacPhee ultimately called and Pauli showed two pair to take this pot down.